Wow, it's been so long since I last did this and I actually miss it. 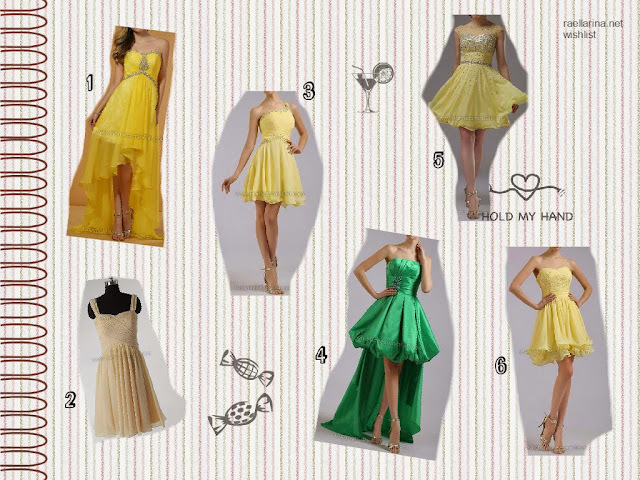 For today's wishlist, I've decided to play with the greens and yellows and look for homecoming dresses. We don't have that kind of event here in the Philippines (or it's not really practiced here unlike in the US) but I thought it would be fun if I'll pretend that I will attend one and I will plan on what I'd wear. In this post, I'm featuring wonderful dresses from Homecomingirl's collections of Cheap Homecoming Dresses and Homecoming Dresses Under 100. Well, being fabulous and glamorous doesn't mean you have to splurge a fortune on your dress! So might as well give you an idea of what you can get under a 100! I love how flowy, long, and dreamy this dress is and the yellow color of the fabric is not super bright, which makes it so sophisticated and elegant. I also love the sparkly details of the dress! This dress is classy and I think you can wear it in any event. I also love how sweet and light the color is and it compliments the "sweet girl" design of the dress. I believe this dress is like the more sophisticated and elegant version of dress number 2. The skirt or bottom part of the dress is beautiful. The only green in this set. I can't believe this is the only green dress I included in this wishlist but the emerald green has captured me and the dress shouts royal to me -- something I'd wear to the royal ball, that is if I'm a royal blood and I'm marrying the prince! lol. Another sweet dress. Sparkles, sparkles, sparkles everywhere! The dress is not too short and not too long so it's perfect! This is a "cupcake dress". It makes me happy. All of these dresses are beautiful. I love the cheery yellow colour and the chiffon. I can imagine you dancing in any one of them. I think my favourite is number 5, the A-line Bateau Chiffon Tulle Short/Mini Beading Homecoming Dress.